A natural burial grave site. The existing landscape is modified as little as possible. Only flat stone markers are allowed. The body may be prepared without chemical preservatives or disinfectants such as embalming fluid, which might destroy the microbial decomposers that break the body down. It may be buried in a biodegradable coffin, casket, or shroud. The grave does not use a burial vault or outer burial container that would prevent the body’s contact with soil. The grave should be shallow enough to allow microbial activity similar to that found in composting. 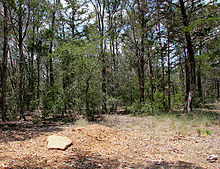 Natural burials can take place both on private land (subject to regulations) and in any cemetery that will accommodate the vault-free technique. A wide variety of land management techniques, such as sustainable agriculture, restoration ecology, habitat conservation projects, and permaculture, may be used to maintain the burial area in perpetuity. Landscaping methods may accelerate or slow down the decomposition rate of bodies, depending on the soil system. Natural Burial Grounds were pioneered in the UK. Many funeral directors encourage a viewing of a dead body at a commercial funeral home as part of a “package” that the family of the deceased pay for, without knowing that it is optional. The primary purpose of embalming is to delay decomposition long enough to allow the body to be viewed. In many countries, the law requires that dead bodies be chilled with dry ice or mechanical refrigeration to prevent microbial growth, though there are no laws mandating embalming, contrary to popular belief. Many cultures around the world use no artificial cooling at all, and bodies are regularly held for several days before their final disposal. Special circumstances, such as an extended time between death and burial, or the transportation of remains on commercial flights (which often require unembalmed bodies to travel in expensive specialized containers), may necessitate embalming. The most common embalming fluid is composed of organic chemicals and contains 5–29% formaldehyde, ethanol and water. This solution is biodegradable in time, but it cross-links proteins found in tissue-cell membranes, slowing down bacterial decomposition and inhibiting the body’s breakdown in the earth. The ability of embalming fluid to contaminate soil or water tables has not been studied thoroughly. In alkaline soils, formaldehyde would be broken down through the Cannizzaro reaction and become Urotropin, but not all soils are alkaline. Formaldehyde is highly toxic to all animals, and is “known to be a human carcinogen”. It is implicated in cancer, Amyotrophic lateral sclerosis, disorders of the nervous system, and other ailments. The U.S.Occupational Safety and Health Administration has the power to require embalmers to wear respirators. Natural coffins are made from materials that readily biodegrade. Ideally the materials are easily renewed or recycled and require less energy for their production. Coffins (tapered-shoulder shape) and caskets (rectangular) are made from a variety of materials, most of them not biodegradable. 80–85% of the caskets sold for burial in North America in 2006 were of stamped steel. Solid wood and particle board (chipboard) coffins with hardwood veneers account for 10–15% of sales, and fiberglass and alternative materials such as woven fiber make up the rest. In Australia 85–90% of coffins are solid wood and particle board. Most traditional caskets in the UK are made from chipboard covered in a thin veneer. Handles are usually plastic designed to look like brass. Chipboard requires glue to stick the wood particles together. Some glues that are used, such as those that contain formaldehyde, are feared to cause pollution when they are burned during cremation or when degrading in the ground. However, not all engineered wood products are produced using formaldehyde glues. Caskets and coffins are often manufactured using exotic and even endangered species of wood, and are designed to prevent decomposition. While there are generally no restrictions on the type of coffin used, most sites encourage the use of environmentally friendly coffins made from materials like cane, bamboo, wicker or fiberboard. A weight bearing shroud is another option. Natural burial grounds employ a variety of methods of memorialization. Families that bury their loved ones in nature preserves can record the GPS coordinates of the location where they are buried, without using physical markers. Some natural burial sites use flat wooden plaques, or a name written on a natural rock. Many families plant trees, or other native plants near the grave to provide a living memorial. Alternatives to burial in the ground include burial in a coral reef, sky burial and burial at sea. People have been known to bury their remains within coral reef balls. These balls are used to repair damages coral reefs. The most prominent organization promoting this is the “Eternal Reefs” group. In some parts of Tibet and Mongolia, a person’s remains are fed to vultures in a burial known as Sky Burial. This is seen as being good to the environment as well as good karma in Buddhism. Burial at sea is seen as a natural burial if done in a way that benefits the environment, and without formaldehyde. Some organizations specialize in natural burial at sea (in a shroud), allowing the body to decompose or be consumed by animals. 827,060 US gallons (3,130 m3) of embalming fluid, which usually includes formaldehyde. When formaldehyde is used for embalming, it breaks down, and the chemicals released into the ground after burial and ensuing decomposition are inert. The problems with the use of formaldehyde and its constituent components in natural burial are the exposure of mortuary workers to it and the destruction of the decomposer microbes necessary for breakdown of the body in the soil. Natural burial has been practiced for thousands of years, but has been interrupted in modern times by new methods such as vaults, liners, embalming, and mausoleums that mitigate the decomposition process. In the late 19th century Sir Francis Seymour Hayden proposed “earth to earth burial” in a pamphlet of the same name, as an alternative to both cremation and the slow putrefaction of encased corpses. The Association of Natural Burial Grounds (ANBG) was established by The Natural Death Centre charity in 1994. It aims to help people to establish sites, to provide guidance to natural burial ground operators, to represent its members, and to provide a Code of Conduct for members. The NDC also publishes The Natural Death Handbook. The first woodland burial ground in the UK was created in 1993 at Carlisle Cemetery and is called The Woodland Burial. Nearly 300 dedicated natural burial grounds have been created in the UK. The Natural Burial Association (NBA) is an independent, non-profit organization established in 2005 to promote natural burial in Canada and to encourage the establishment of natural burial sites there. New Zealand’s Natural Burial organisation was started in 1999 by Mark Blackham. It is a not-for-profit organization that advocates for natural cemeteries, promotes the concept to the public, and certifies cemeteries, funeral directors and caskets for use in participating cemeteries. The first natural cemetery in New Zealand was established in 2008 in the capital, Wellington, as a partnership between the Wellington City Council and Natural Burials. It is the nation’s biggest natural cemetery, covering approx 2 hectares, and home to 120 burials (April 2015). More natural cemeteries have since been set up by between Natural Burials and the council authorities in New Plymouth in 2011,Otaki in 2012. and Marlborough in 2014. Other councils have set up small natural burial zones: Marsden Valley in 2011, Motueka in 2012, and Hamilton in 2014. Although these have all based on the approach used by Natural Burials, they have not been certified by the organisation. Billy Campbell, a rural doctor and a pioneer of the green burial movement in the USA, opened the first modern “green cemetery”[clarification needed] in North America at the Ramsey Creek Preserve in South Carolina in 1998. The Green Burial Council (GBC) is an independent, tax-exempt, nonprofit organization that aims to encourage sustainability in the interment industry and to use burial as a means of ecological restoration and landscape conservation. Founded in 2005, the GBC has been stewarded by individuals representing the environmental/conservation community, consumer organizations, academia, the deathcare industry, and such organizations and institutions as The Nature Conservancy, The Trust for Public Land, AARP, and the University of Colorado. The organization established the nation’s first certifiable standards for cemeteries, funeral providers, burial product manufacturers, and cremation facilities. As of 2013, there are a total of 37 burial grounds certified by the Green Burial Council in 23 states and British Columbia. A cemetery becomes certified by demonstrating compliance with stringent established standards for a given category. The aforementioned Ramsey Creek Preserve is certified by the GBC. Conventional funeral providers in thirty-nine states now offer the burial package approved by the Green Burial Council. Most of the 32-acre (130,000 m2) Fernwood Burial Ground, adjacent to the Golden Gate National Recreation Area in Mill Valley, California, is set aside for natural burial, with no tombstones or caskets. Penn Forest Natural Burial Park (PennForestCemetery.com) is the first Natural Burial Grounds in Pennsylvania certified by the Green Burial Council. 2-1/2 acres are laid out for burial, and the other 32-1/2 acres are available for other uses: a barn for goats that clear the property of brush, hiking trails, gardens, an acquaponic pond for fish and vegetables, a blacksmith teaching shop, beehives and other sustainable projects. Foxfield Preserve, adjacent to The Wilderness Center’s headquarters near Wilmot, Ohio, was the first nature preserve cemetery in the US to be operated by a nonprofit conservation organization. Naturalists from The Wilderness Center have restored this formerly agricultural land to native prairie grasses and wildflowers. A section has also been reforested in native hardwood trees. Circle Cemetery, located at Circle Sanctuary Nature Preserve in southwestern Wisconsin, has offered burial of cremated remains and non-embalmed bodies since 1995. It is operated by Circle Sanctuary, a Wiccan church. Cedar Brook Burial Ground in Limington, Maine, the first green cemetery in Maine is located on a 150 acre tree farm thirty miles due west of Portland. Within its borders sits the rock wall-enclosed Joshua Small Cemetery, a tiny, historic graveyard whose dozen burials date back to the early 1800s. River View Cemetery, located in Portland, Oregon is registered with the Green Burial Council as a “hybrid” natural burial cemetery. Rather than restricting natural burials to just one specific section, River View permits natural burial in nearly every area of the cemetery, allowing those who wish to be interred in existing family plots without an outer burial container, without embalming, or even without a casket if they choose to do so. Steelmantown Cemetery is the only cemetery in the State of New Jersey certified and approved by the Green Burial Council as a Level 3 Natural Burial Ground. Jewish law forbids embalming for traditional burials, which it considers to be desecration of the body. The body is ritually washed by select members of the Jewish community, wrapped in a muslin sheet, and placed in an all-wood casket. The casket must not have any metal in it, and it often has holes in the bottom to ensure that it and the cadaver rapidly decompose and return to the earth. Burial vaults are not used unless required by the cemetery. In Israel, Jews are buried without a casket, in just the shroud.